Performers include: Lance Henriksen, Brittany Tiplady, Terry O’Quinn, Megan Gallagher, Klea Scott, Stephen J. Lang, Stephen E. Miller, Bill Smitrovich, Kristen Cloke and Peter Outerbridge. Created by Chris Carter (The X-Files), this sci-fi drama series follows Frank Black (Lance Henriksen), an ex-FBI profiler who has the skill of knowing how serial killers and murderers view the world around them. Moving from Washington, D.C. to Seattle with wife Catherine (Megan Gallager) and daughter Jordan (Brittany Tiplady), Frank enlists with the Millennium Group, which is comprised of former law enforcement officers who battle crimes together as the new millennium approaches. He helps old friend Lieutenant Bob Bletcher (Bill Smitrovich), a Seattle homicide detective, and later, Millennium Group agent Peter Watts (Terry O’Quinn). When Frank’s work interferes too much with his family life, he and Catherine separate. The longer that Frank stays with the Millenium Group, the more he realizes they may be using his gift for their own gain. Working with Lara Means (Kristen Cloke), he learns that they may be trying to take over the world. A deadly virus threatens the population of the planet and in its wake, takes Frank’s wife Catherine. 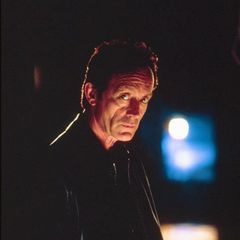 Frank and daughter Jordan survive and the incident drives Frank back to the FBI in Washington, D.C. to work with new agents Andy MacLaren (Stephen E. Miller), Emma Hollis (Klea Scott), and Barry Baldwin (Peter Outerbridge). The real case Frank wants to solve is that of the mysterious Millennium Group. This was a truly exceptional show. It was dark and tense, with equal amount of human-caused tragedy and a touch of the supernatural. The integration of Biblical end-times philosophy and cults later on was very well done. Great writing and Lance delivered every single episode.